The Benton Economic Partnership, Inc. is a non-profit economic development organization located in Foley, Minnesota, which encourages and leads economic development efforts throughout Benton County. The Partnership is committed to business retention and expansion, downtown redevelopment, workforce development, marketing the county, and quality of life initiatives. Since the Benton Economic Partnership is entering its second year of operation, a website to highlight the economic assets embedded in Benton County was a priority. The website will serve as a platform to help the organization more effectively connect with member investors and provides an opportunity to promote businesses and communicate the community's collective support for economic development. 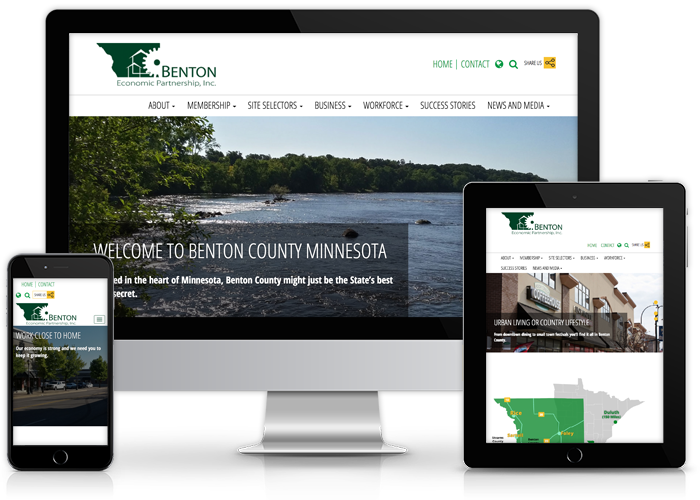 Our designers and copywriters worked closely with the Benton Economic Partnership staff on strategic marketing goals and to ensure the website is a visually compelling representation of Benton County. The new site was launched with a comprehensive marketing campaign that communicates the ongoing economic development efforts of Benton Economic Partnership.